Yesterday was the mid-autumn festival also known as Lantern Festival. I love this festival because of the yummy mooncakes!! My silly mommy don't like mooncakes. This is the standard mooncake. There's a egg york in the middle.Mommy took out mine. This is another type of mooncake. It durian flavor, my favorite!! I demanded mommy to give me a bigger piece. Find your biker single now!! Are you a biker single looking for another biker single? If yes, bikerplanet.com is just for you!! bikerplanet.com is a biker dating site, a great community for biker singles to meet, make friends or to find true love. Joining bikerplanet.com is fast and easy. Just follow the steps to sign up for the site. Search through the thousands of biker singles in your area. Signing up for the site is 100% FREE !! Check out the latest profiles of the members, biker personals and other great features just for the members. Just send a message to get to know the other biker singles and browse through photo section of the members. It is easy to find the right biker singles for you!! tattoolovers.com is a tattoo dating site, a great community for tattoo lovers to meet, make new friends or to find the long lost partner that shares the same interest. Joining tattoolovers.com is fast and easy. Just click the SIGN UP button and fill in all the information. Signing up for the site FREE. There's a list of new members' profile in the homepage. It is easy for members to look through other members' profiles and send them a message for an introduction. There's also a search engine for members to search for the right person based on their preferences in age, personality, interests and so on. Members can browse through to photo section to see the members' photo. tattoolovers.com also offers Tattoo chat, Tattoo women, tattoo personals and other great features just for the members. datingforsenior.com is a senior dating site, a great community for older men and women to meet or to find the senior match or just to make friends. The site has a very nice and pleasant layout. There're a lists of new members' profile in the homepage. It is easy to look through other members' profiles and send them a message. It is fast and easy to sign up for datingforsenior.com . By filling up the needed information and finish. There's also a search engine for the members to look for the right man or woman for their age, personality, interests and so on. The search engine allows members to search in-detail based on their preferences. Members can also browse through the photo section, photos of the other members.Members can easily look for the one they are looking for. Joining datingforsenior.com is also FREE !! Heeeyyy'alllll!! I'm on my way to Asta's barkday pawty with my horsie. 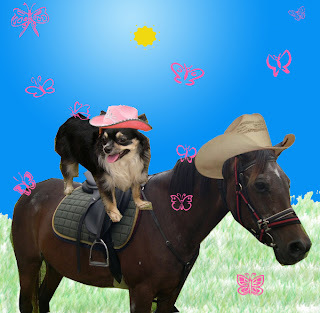 I'm wearing my pink cowboy hat and I made horsie wear it too. I can't wait to taste the western yummies!!! and the square dance. I wanted to bring some yummies too but my hooman was too busy. See y'all soon at the Pawty!! 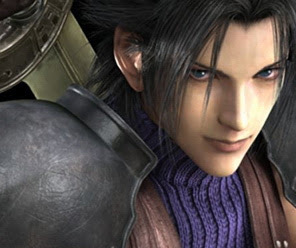 Sorry for not updating and visiting everyone's blog, mommy too busy studying..
Mommy is a big fan of Final Fantasy by Square-Enix. Can't wait for the exam week to pass..
Have a gweat Weekend Everydoggy and GG and Moosie!! Feeling bored during city breaks or short break? Why not go for a holiday with DialAflight. DialAFlight also offers the most exciting cities around the globe for you to choose from and fulfill your every requirement. They will do all the arrangement which include flight booking and hotel reservation. You will also get the best holiday offers in DialAFlight. Go for a shopping spree in New York City or Kuala Lumpur to witness the beautiful Twin Petronas Tower. I was like this after Chilli's beach pawty. I had so fun running, jumping, swimming , and playing volley ball at the pawty.I really enjoyed the unlimited supplies of wally melon and other goodies. Thanks for all doggies that looked for me while I was lost in the island. I found my way to Chilli's Pawty with my hyper-sensitive nose, Haha. It was so noisy that I have to cover up my ears to have my beauty sleep. I was too tired to realized how silly I look. I'm going to take a nappy now. Night nitght. R.G. Skin Revitalizer is an oil extract from tropical superfruit, Gac, a native fruit of Vietnam. It is essential for the skin; a daily skin nourishment highly rich in antioxidants to prevent skin and body from degenerative conditions. It also offers high level of natural antioxidants that help support strong cellular rejuvenation that works from the inside out. Introducing Gac Fruit also known as Momordia Cochinchinemis Spreng, is a bright red-fruit can find mainly in Vietnam. It is used for health and medical purposes for the local Asian households. Many locals claimed Gac as the “fruit of heaven” and believed to have the ability to promote health, vitality, and longevity; many also said Gac is a fountain of antioxidants as heard from the recent researches. Researches found that beta-carotene, lycopene and other beneficial antioxidants found inside the gac fruit that help support strong cellular rejuvenation process throughout the body. Gac fruit is rich with carotenoids which provides skin with daily nourishments and protect skin from free radicals. Carotenoids also helps boost immune system and protect skin from harmful sunlight. RedGac is oil, different from other exotic fruit supplements which are juice. Oil is much better then juice because oil is able to supply and deliver high natural level of antioxidants for the body. Weekend with Mommy!! & Beach Pawty!! I spent this weekend with mommy alone. The family went back to their hometown this morning. I wasn't allowed to follow so mommy decided to stay back and take care of me and the house. There is only me and mommy at home. The house is quiet without the family. Still Me and mommy had so much time together. She played with me the whole day. She has been very generous the whole day too!! Mommy fed me burger, pork curry!! Yumyum!! Ice-cream!! My favorite flavor: Vanilla!! So cold and creamy!! 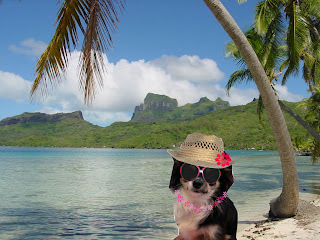 I'm all ready for Chilli's beach Pawty!! Since it is going to be a hot day, I need my beach hat and my sunglasses. I'm already at the beach, I wonder where's Chilli and the others. I think I'm on the wrong side of the island. Can someone get me? Hhhheeeelllpppp.. Funny video of me, encounter with a BUG!! Anydoggies or GG encounter a buggy before? I love PayPerPost!! Is so much fun blogging for PPP and the best part is I'm getting paid for it. I joined PPP last month on August, I'm still quite new. PPP traffic generation for my blog. I have earned $30 so far which I am really happy with it. I am planning to earn more and save it until I have save enough, then I'll buy stuffs for my pets. I am still trying to improve my writing skills, though I think I improved a bit. I have a new passion for blogging now, all thanks to PPP. I am really happy and satisfied with the Customer Love service because they are really polite and I'm happy with the time they responded to me. Spreading the LOVE for PPP!!! Hotel Reservations is a great site to go to check on price rate, hotels, flight booking and just about anything that do with travels and vacations. The site offer low rates and great deal for the customers. HotelReservation.com is an international site and bookings are available worldwide. Customers can easily search for hotels, motels, resorts and vacation rentals that are available in the country they would like to go. There's a search engine convenient for customers to look for the hotel that best fit their criterias. Show all the information of the hotel including pictures of the hotel, price list offers, hotel features and many more. Customers can make easy decision and less fuss on decision making. The site also offers great hotel deals from time to time. Customers can also book their flight online through HotelReservation.com. It's fast and easy, only takes few minutes to complete a flight booking. Comparing the price rates will be much easier. HotelReservation.com also offers car rental services from various suppliers. It is easy to search for the right car and compare the prices offer by the suppliers. There're also vacation packages provided by HotelReservation.com. With the holiday package, it is easier to plan a holiday. It is much more convenient and not time consuming. Customers are positive that they are making the right choices. Having trouble traveling with a big group? Try the Group Booking section and let the HotelReservation.com Group Department handle the arrangements . The HotelReservation.com also helps customers to plan big events like weddings, reunions, business events and other social events. Customers can choose their destination or interest and HotelReservation.com will recommend the best country or city that match their interest with the lower price. HotelResevation.com guaranteed the lowest rate and can save up to 70% off. Customers can save big bucks from travel expenses. They also offer rebate to their customers. Gas rebate for customers worth $30. Rebate up to $100, depending on how many nights the customer book. HotelReservation.com is reliable and they serve customers to maximize satisfaction and making sure they have a great fun vacation. This is Shumai. Very tasty. Pork and prawn. Lou Mai Fan. This one is one of my favoriiiteee. I don't know what dim sum is this.. It has vegetable inside. Fried Prawn wrapped with fuzhou. Very crispy and love the prawn. What a gweat lunch.. But the next stop is the VET!! Uh-oh.. I'm inside the vet!! The doctor did a check up on me and put me on the weighting machine. I am 3.9KG. 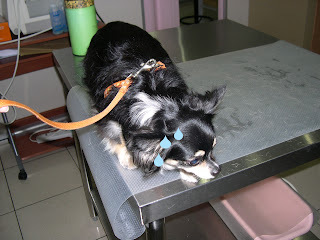 The doctor told mommy that I;m overweight and I need diet. Then he took the pointy needle thing and jab me. I was so nervous but mommy was there to comfort me and I didn't struggle at all. YIppEE!! Is over!! Let me Outta here!! I wonder how Rossi escape from going to the vet. I have to learn from him..